Find cleverly-hidden items for your customers and rack up the cash. 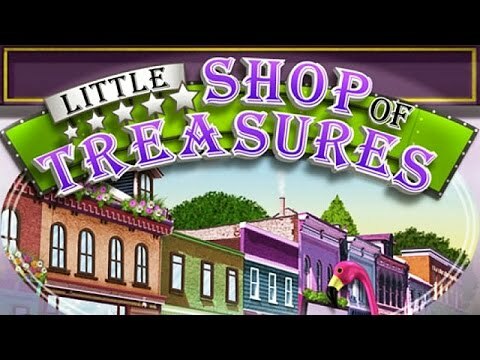 "The first Hidden Object game I ever played was Little Shop of Treasures. My best friend, her grandchildren and I played on weekends. It holds a lot of good memories for me." Welcome to Huntington, a charming little town where if you look close enough, your dreams will come true. Help Huntington's shop owners find more than 1200 cleverly-hidden items for their customers and earn enough cash to open a shop of your own. Featuring two great ways to play, an innovative hint feature, endless re-playability and more, this eye-popping challenge will bend your brain and dazzle your eyes. Little Shop is a great game. It is a fun challenge to find all the hidden objects. It does an excellent job of keeping my mind active. Enjoyed the variety of places, the wide range of hidden objects, and I appreciated that there weren't puzzles or maps. Love all of the Little Shops! Absolutely love this game. Keeps me entertained for hours. Love to play when I have some wind-down time. It is a fun challenge to find the hidden objects in this game. It is a great game that has a ton of objects to find. I like that they use a lot of unusual types of objects. I highly recommend this game.